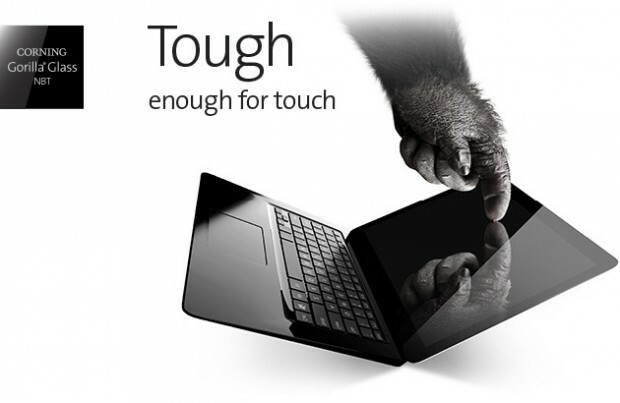 Gorilla Glass has been the name associated with strengthened mobile phone glass since 2010, but now Corning, the company behind it all plans to take it to the next step by introducing Gorilla Glass NBT for touch-enabled laptops. This new layer of glass promises to bring all the features of the Gorilla Glass 3 to a larger Laptop size glass. “Known as the cover glass of choice, Corning Gorilla Glass now extends its exceptional capabilities into the emerging touch-enabled notebook market,We are confident that Corning Gorilla Glass NBT will outperform legacy soda lime glass, delivering eight to ten times more scratch resistance. In fact, for just one to two percent of a notebook’s retail price, consumers can now get the best cover glass solution: a Gorilla solution. Simply put, we believe that if you don’t have Gorilla on your device, it’s not as good.” said James R. Steiner, senior vice president and general manager, Corning Specialty Materials. Gorilla Glass NBT will be available by Fall 2013 and should be incorporated in most manufacturer touch enabled laptops by 2014. CORNING, N.Y., July 29, 2013 – Corning Incorporated (NYSE: GLW) today introduced its newest cover glass, Corning® Gorilla® Glass NBT™, designed to help protect touch notebook displays from scratches and other forms of damage that come from everyday handling and use. 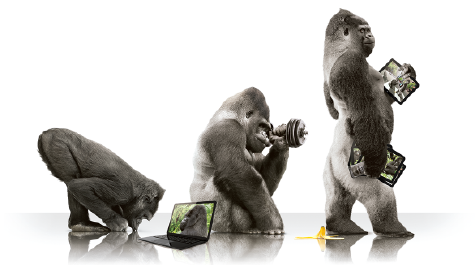 Gorilla Glass NBT is Corning’s unique glass solution for touch-enabled notebooks. Touch is becoming the primary way consumers are interacting with their mobile devices; and with increased touch comes the potential for the glass to scratch. Scratches can result in the cover glass breaking, when the devices are subject to normal day-to-day usage. Corning Gorilla Glass NBT provides enhanced scratch resistance, reduced scratch visibility, and better retained strength once a scratch occurs to help protect notebook displays from breakage that can occur with lower-performing soda lime glass. Consumers want thinner, sleeker and lighter-weight personal computers featuring touch technology. Noted as the next wave in touch technologies by market research groups, touch-enabled notebooks have the potential to approach the size of the current smartphone cover glass market within the next few years. Corning Gorilla Glass NBT delivers the cost-effective scratch and damage resistance that consumers have come to expect of the world’s leading cover glass solution to this new mobile device market. Similar to a handheld or tablet device, the consumer’s physical interaction intensifies with a touch-enabled notebook device to include swiping, tapping, gripping and cleaning. Everyday interaction with these notebook devices can result in scratched cover glass and a compromised user experience. Corning’s consumer research indicates that complaint rates for scratching on notebooks are already up to four times higher compared to other mobile devices. Replacing the screen can be expensive and sometimes cost as much as half of the full notebook price, while leaving the user without a device for days.